With a new logo design our main interview was with three original members my favourite UK Brit Jazz Funk band, Light Of The World who formed Beggar & Co. Kenny Wellington, Neville “Breeze” McKreith and David ‘Baps” Baptiste. I was in my element speaking with all three for around 2-3 hours and this took up 3-4 pages. 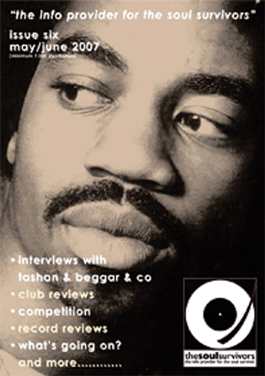 We gave front cover to interviewee Tashan who had contacted me and gave me permission to use his song “Soul Survivors” for my radio shows. John Dean joined us for a new feature “Soul From The Floor” and we added two extra pages from our original 16.